WASHINGTON – Angel Pagan hit an inside-the-park home run and started a triple play Wednesday night, but that wasn’t enough for the New York Mets in a 5-3 loss to the Washington Nationals. Pagan became the first player in 55 years to take part in both feats in the same game. Despite his achievements, the Mets lost for the ninth time in 11 games. Pagan hit the first inside-the-park home run in Nationals Park history in the fourth inning. An inning later, the center fielder’s shoestring catch led to the Mets’ first triple play since 2002. Phillies shortstop Ted Kazanski was the last player to do both, on Sept. 25, 1955, for Philadelphia against the New York Giants, the Elias Sports Bureau said. That was also the last time a team pulled a triple play and hit an inside-the-parker in the same game, Elias said. A thrilling sight, not doubt. Although I’m sure Mets fans would have appreciated it if their team had won the game as well. Instead, they lost to the Nationals 5-3. Incidentally, this is Pagan’s second inside-the-part home run. His last came in September of last year against the Phillies. A three-game series between the New York Mets and Florida Marlins in June has been moved from Miami to San Juan’s Hiram Bithorn Stadium in Puerto Rico. Major League Baseball made the official announcement Thursday. Florida will remain the home team, and the games will be played June 28-30. Hiram Bithorn hosted 22 Montreal Expos home games in each of the 2003 and 2004 seasons before the franchise relocated to Washington and was renamed the Nationals. Average attendance dropped from 14,000 in 2003 to 10,000 in 2004. I have never liked these transplanted games. Not when the Miami Dolphins played a home game in London or when the Florida Panthers played a game in Helsinki. Why are South Florida sports fans being needlessly penalized by pro sports leagues. We only have so many home games against popular teams in a given year. The New York Giants have played in South Florida a grand total of twice in 40 years since the AFL and NFL merged. The Blackhawks haven’t been to South Florida in over 3 years, and the Mets when they visit down here are one of the biggest draws for baseball fans. We get screwed, and I’m sick tired of it. Up yours Bud Selig. Why not a Brewer game in Puerto Rico? I remember Bibby quite well. He was a good MLB pitcher who went 111-101 in a 13-year career. He was most remembered for his time in Texas and Pittsburgh but played for St. Louis and Cleveland also. Here’s something you probably won’t hear in reports on his death. He was originally in the New York Mets organization. 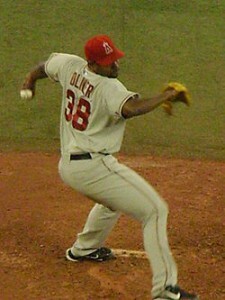 A poor man’s black version of Nolan Ryan. Hard throwing righty with arm and control issues. The Mets gave up on Bibby at the same time they did the same with Ryan. Ryan went to California for Jim Fregosi and Bibby went to St. Louis for among other others Jim Beachump and Harry Parker. A pinch hitter and long reliever respectively on the 1973 pennant winning Mets but hardly compensation for a pitcher who went on to win 111 games. The Mets made a lot of bad trades and this is one of them though it was lesser known than others. Thanks for memories Jim Bibby. RIP. Community Funeral Home in Lynchburg said Wednesday that Bibby died Tuesday night at Lynchburg General Hospital. The cause was not disclosed. The family asked for privacy but said a statement would be released later. Bibby played 12 years in the majors and pitched the first no-hitter in Texas Rangers history, beating Oakland 6-0 in 1973. 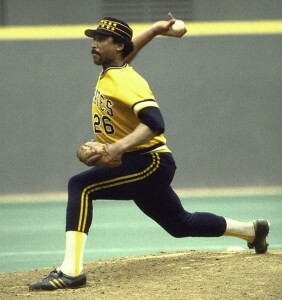 He was a member of the Pittsburgh team that won the 1979 World Series, starting two games against Baltimore — including the deciding seventh game. Former major league All-Star Jose Offerman threw a punch at an umpire during an argument in a Dominican winter league game Saturday night, the second time in 2Â½ years that he’s attacked someone on a baseball field. Offerman, manager of the Licey Tigers, appeared to hit first base umpire Daniel Rayburn in the face or neck with his fist during a heated discussion in a game against the Cibao Giants. Rayburn fell to the ground. Offerman was detained by stadium security and taken to a police station to wait until the end of the game to see if Rayburn would press charges. The Giants were winning 6-0 in the third inning of the final game of the winter league semifinal playoff series when plate umpire Jason Bradley ejected catcher Ronny Paulino for arguing balls and strikes. Offerman came onto the field to talk to Bradley, but ended up arguing with Rayburn. It was the latest violent outburst by Offerman, an All-Star infielder with the Los Angeles Dodgers in 1995 and Boston Red Sox in 1999. On Aug. 14, 2007, he was batting for the Long Island Ducks against the Bridgeport Bluefish in an independent minor league game when pitcher Matt Beech hit him with a fastball. Offerman charged the mound with his bat and swung at least twice, striking Beech and Bluefish catcher John Nathans. At present Nathans is suing Offerman in Federal court claiming he suffered permanent injuries. Offerman’s displays of temper have probably kept him from a earning a Minor league coaching or managing job in the United States. If I were in baseball, I’d question his suitability for any job related to the sport. Right now he isn’t mature enough to hold any job given to him. At a time when Bobby Valentine has begun the process of talking with teams about a possible return as a manager in Major League Baseball, sources said he is in communication with the Florida Marlins about a possible position with that team — less than eight months after Marlins manager Fredi Gonzalez received a two-year extension. Gonzalez, 45, has managed the Marlins the last two seasons after replacing Joe Girardi, and Florida has contended in both years. Gonzalez was named The Sporting News Manager of the Year in 2008. Gonzalez agreed to a two-year extension with the Marlins in spring training, and he is signed through the 2011 season. However, there has been concern on the coaching staff this week after they were told that no decision has been made about whether to bring them back for 2010. Jeffrey Loria, the Marlins’ owner, is meeting with club executives after the end of the regular season. Valentine, 59, has managed the Texas Rangers for eight seasons and the Mets from 1996-2002, and over the last six seasons he has managed the Chiba Lotte Marines. Valentine is supposed to be a candidate for jobs in Cleveland and Washington. Have the Marlins really talking to Valentine? I make a bet they did. Will they hire him as the team’s next manager? Loria is an unpredictable idiot owner as can be seen by his firing of Joe Girardi three years ago. He has also made it clear he won’t spend any more amount of money on the Marlins than he absolutely has to. Valentine is not going to be a cheap hire for a MLB team. I therefore don’t see him as a future Marlins manager. Johan Santana needs surgery for bone chips in his left elbow and the star pitcher is out for the season, the latest blow to a New York Mets team battered by injuries. Santana said he had the same operation after the 2003 season and came back with a career-high 20 wins and the first of his two Cy Young Awards for the Minnesota Twins. I won’t speculate on Santana’s long term prognosis. As for the Mets, 2009 is a very disppappointing year for the franchise. 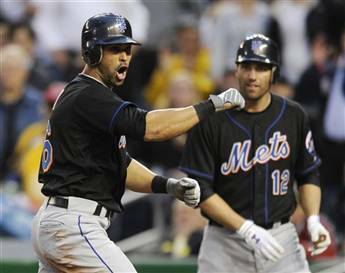 Even with a healthy return of Santana in 2010, I don’t expect the Mets to be challenging for the playoffs. Afterward, Bruntlett said he wasn’t certain if he heard anything. He was somewhat occupied at the time. The Phillies utility infielder was indeed touching everybody and everything, making history in the process. In a blink, the second baseman pulled off one of the rarest occurrences in the wacky game of baseball – a game-ending unassisted triple play in a 9-7 win over the New York Mets yesterday at Citi Field. It was the second time in the cockeyed history of the major leagues that a game ended on an unassisted triple play. The first was May 31, 1927, when Detroit Tigers first baseman Johnny Neun ended a game against Cleveland, but it’s not likely Neun got the same sense of satisfaction as Bruntlett. His unassisted triple play was only the 14th in the regular season in big-league history – a 15th occurred in a World Series game – and the first by a Phillie since Mickey Morandini pulled one off on Sept. 20, 1992. Morandini was accused of trying to sell ‘the ball’ when videos clearly showed him disposing of it after the play was over.